Fit out of 2,200 sf for high end sales of Italian shoes. Design was produced in Italy. It was converted to US standards and adjusted for code compliances. Federal Construction Corp. is a full service General Contractor and Construction Manager. We provide a full set of services from Design-Build to General Contractor to Cost Analysis. Meeting our client’s needs is paramount. We believe that the road to success is always under construction and that a team approach will always get us there. FCC is awarded the Potbelly Redemising project located at Wayside Commons. FCC completed the Destination Maternity retail space at Wayside Commons. FCC substanitally completes the Boyden Hall 2nd Floor Office Renovations at Bridgewater State University. FCC has been awarded the Boyden Hall Human Resources Renovations Project at Bridgewater State University. Construction is expected to being at the end of the month. FCC has been awarded the Destination Maternity Fit-out at Wayside Commons in Burlington. FCC has been awarded the Food Study Lab Project at Framingham State University. FCC has been awarded the Guitar Center White Box in Durgun Square Portsmouth, NH. FCC Completes the Tronick Suite Fit-Out Project located at University of Massachusetts Boston. FCC has been awarded the University of Massachusetts Tronick Suite Renovation Project. This project consists of 1,400 sf fit-out of offices and labs. FCC substantially completes the Miller Hall 3rd Floor Renovation and the Conlon FA 264 Renovation at Fitchburg State University and is now ready for occupancy. FCC substantially completes the Starbucks Fit-Out at UMass Lowell. The Owner has begun training and is scheduled for opening on 8/29/11. FCC substantially completes the Pierpont Student Basement Rooms at UMass Amherst. FCC is awarded the Starbucks Fit-Out at the UMass Lowell O'Leary Building. FCC is awarded the UML Learning Commons Project. Construction is expected to start on June 6, 2011. FCC is awarded the Conlon FA 264 Renovations Project at Fitchburg State University. FCC substantially completes the 4th floor O'Leary Building Renovation Project at UMass Lowell. FCC has been awarded the Pierpont Student Rooms project located at University of Massachusetts Amherst. FCC has been awarded the Miller Hall 3rd Floor Renovations located at Fitchburg State University. FCC substantially completes the UMass Lowell Continuing Education Renovation Project. FCC is awarded the Ceramic-to-Metal Seals Fit-Out project located in Winchester, MA. FCC completed the Honey Dew Donuts project located in Danvers, MA and they are now open for business. FCC is awarded the Wannalancit Building Renovation Project at UMass Lowell. Construction is expected to start in early December. FCC is awarded the O'Leary 4th Floor Renovation Project at UMass Lowell. Construction is expected to start in December. FCC substantially completes the Fox Hall Renovation Project. The Taco Bell, POD Convenient Store, and Sal's Pizza is now open for business. FCC's DCAM single project limit certification has been increased to just over $2,000,000. FCC is awarded the Fox Hall Market Place Project located at UMass Lowell which consists of a Taco Bell and Convenient Store. FCC completes the West Boylston Water District Renovation project. FCC completes the Subway Fit-Out Project located on the UMass Lowell Campus in 25 Calender days. FCC has been awarded the Continuing Education Office Renovations located at UMass Lowell. FCC has been awarded the Subway Deli Fit-Out located at the UMass Lowell campus. FCC has been awarded the Stratton Elementary School Improvements Project located in Arlington, MA. FCC has been awarded the Additions and Renovations Project at the West Boylston Water District Building. 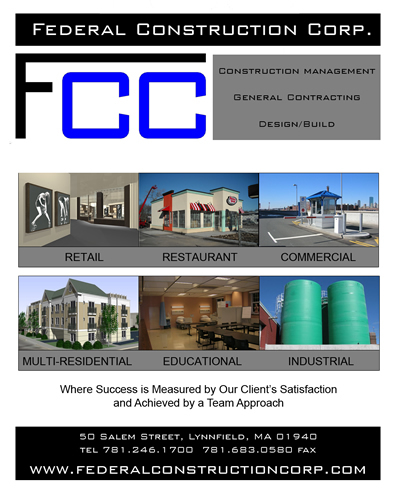 FCC has been awarded the Renovation Honey Dew Donuts Project located in Danvers, MA. FCC has been awarded the New Bedford Honey Dew Donuts Project. Emilio Licciardi & Randal Boughton have passed the LEED GA exam. FCC has been given notice of award of the Registry of Motor Vehicles Fit-Up at the Early Jr. Garage Project in Lowell, MA. FCC receives notice of award of the Village Shops of Salem Project. FCC receives the Notice to Proceed for the Gymnasium Locker Room Upgrade Project at the Mass Maritime Academy in Buzzards Bay. FCC completes the West Side Drive Access Controls at the Boston Convention and Exhibition Center. FCC completes the Giuseppe Zanotti Design Boutique in Coply Place Mall. FCC completes the Wing 2A Renovations at the Worcester State Hospital for the Department of Mental Health. FCC receives notice that it is the successfull low bidder on the Lynnfield Police Station Renovations. FCC receives DCAM Certification in the "General Building Construction" catagory to bid public projects in Massachusetts valued over $100,000. FCC has been awarded the West Side Drive Vehicular Access Project. FCC has achieved substantial completion on the Office Renovations, Mass Mutual Center, Springfield, MA. Awarded the Worcester State Hospital Wing 2A Renovation, Worcester, MA. FCC has received an increase in their Prequalified approval to bid on NH DOT Projects in excess of $2 million. FCC has been approved to do business in the states of New Hampshire, Vermont, and Maine. Rhode Island and Connecticut are pending.
" They were professional, reliable, and very conscientious of the work..."
”...attentative to all aspects of the job scope and completion dates to ensure deadlines are met..."
© 2009 Federal Construction Corp.